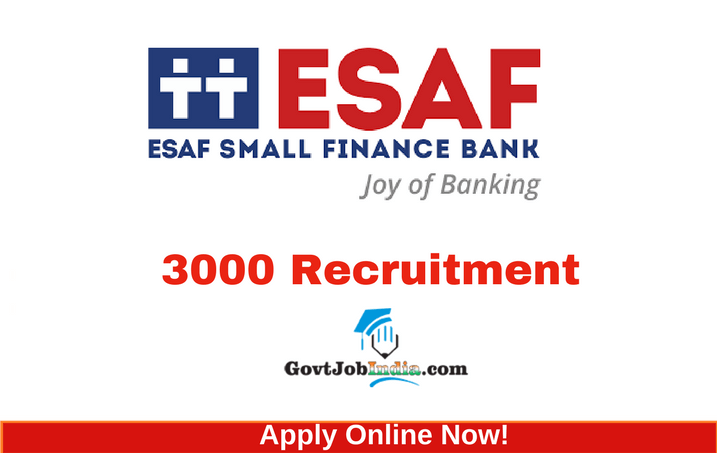 ESAF Small Finance Bank has given out 2018 massive recruitment notification with a large number of vacancies (3000 bank jobs) out of which 1500 vacancies are for Sales Officers – Retail Assets & Liability, 400 for Relationship Officer and Various Vacancies. The official website which has the ESAF official notification PDF document for the bank recruitment 2018, is www.esafbank.com. The last date to apply online is 21st May 2018. So apply now before the deadline runs out! Here is the perfect opportunity for people searching for govt jobs in Kerala, India. If you are to do the registration for the same, then we have also given the ESAF Bank recruitment online application link. This is an amazing chance for you to secure a latest job in banking sector. We have given the eligibility criteria, age limit, educational qualification, how to apply, application form and fee. And we have also given information about result and admit card of the ESAF Bank recruitment 2018. The various eligibility criteria mentioned below are for the posts of those 3000 vacancies. The candidate must be minimum of 21 years of age and a maximum of 40 years. Basically, the candidate should be between 21 and 40 years as on 30.04.2018. Age relaxations are applicable according to the government norms which are specified. PLEASE NOTE: Age limit is not a criteria for highly experienced banking officers and senior employees. Sales Officer (Trainee): Candidates need to have a post graduate degree in any discipline from a recognized University without any backlogs or Graduates with one year sales experience. Also, applicants need to have a talent in sales and marketing. Sales officers- The candidates who are applying for this post must have post-graduation from any recognized university and 3 years of experience in sales (Telecom /FMCG/Hospitality /Sales experience in Banking /Financial products). Candidates also need to have an interest in sales and marketing. Relationship officer: The candidates need to have a degree or Post graduation in any stream. 2 years’ experience in banking, NBFC, Hospitality or any other financial streams. Assistant bank head: Must have graduation or post-graduation from any legitimate board. 5 years of experience must be there in banking as Assistant Branch head. Branch heads: The applicant must have passed graduation or post-graduation in any discipline. There is also a need for 8 years of experience as banking branch head. Credit officer: The aspirant must have graduation in any one subject and 1 year experience in credit appraisal. The ESAF bank recruitment 2018 has no application fee and you can apply for it without paying any amount as fee. . The selection process for the ESAF bank recruitment is divided into the following parts. The pay scale for the ESAF banking recruitment 018 will be based on the post and the qualifications of the candidate. And now, fill out all your details required to fill the form. Next, submit all the documents required by the authorities to confirm your application form. As there is no application fee, you can directly proceed to click the final submit button. Please don’t forget to take a print out of the same and preserve it for further use. Please note that those candidates who fill in false information or fabricated documents will be rejected if found. Candidates are warned to not get any banned item into the examination hall, including mobile phones for the safeguarding of these items is not assured by the authorities. Please also note that the selection process is purely based on merit, experience and performance. Candidates are expected to note that the application procedure is entirely online in nature and there is also no application fee for the following procedure. The admit card for the ESAF bank recruitment 2018 hasn’t come out yet. It is assumed that the dates for the release of the admit card will be around 2 weeks before the exam commences. So it is assumed that the admit card will be released somewhere between July end and August beginning. The result for the final merit list will be out by the end of this year 2018. The dates are tentatively said to be around December or somewhere around that time. For more details, check out ESAF Bank recruitment 2018 result. Hope you found this article about ESAF Bank recruitment 2018 helpful. If you did find this article useful, subscribe to our website for more updates about latest govt jobs in India by entering your email ID and also bookmark us to your browser so that you get updates about upcoming govt jobs in India. If you have any doubts regarding this vacancy or any other vacancy which we have enlisted here, then leave it down in the comments and we will get back to you as soon as possible.